You must make reservations at least 5 minutes in advance of the time at Caulfield's Bar and Dining Room. Valet parking is $12 with restaurant validation for the first three hours. There is also street parking available. Caulfield's Bar and Dining Room is available for private bookings. Offering a contemporary American cuisine with tasteful European influences, Caulfield’s Bar and Dining Room unites New York swagger, Paris allure and Hollywood history. Located on the first floor of the SIXTY Hotel in Beverly Hills, the venue offers a private back dining room with old-school Cadillac style booths, a vintage bar with a premium selection of craft cocktails, beer and wine and a sophisticated front dining room naturally lit by French inspired windows. Highlights from Caulfield’s innovative menu are also featured at its famed panoramic rooftop bar, Above SIXTY. Open every day for breakfast, lunch and dinner, and Sundays for Brunch, Caulfield’s is Beverly Hills best kept secret! Join us for our family friendly Mothers Day brunch with bottomless mimosas and a pre-fixe menu for $50 per person. Our chef curated menu includes brunch items like Avocado Toast, Smoked Salmon, Katsu Crispy Chicken Sandwich and much more! Join us for our family friendly Easter Sunday brunch with bottomless mimosas and a pre-fixe menu for $50 per person. Our chef curated menu includes brunch items like Avocado Toast, Lemon Ricotta French Toast, Katsu Chicken Sandwich and much more! Very nice space. It was almost empty, which is too bad. The food was good and the service excellent (wonderful server; sorry did not catch her name). We had a cocktail before dinner and wine with dinner. I had a charcuterie board (great choices and nice presentation) and my friend had the short ribs which she said were great. We shared some really excellent brussels sprouts with balsamic. I'd definitely eat there again. We love this place because we get quality food and it is always quiet. I really don't understand why more people don't run to this neighborhood gem!!! As soon as I walked in I was greeted by a charming and friendly host. (Francesca, I think) She was gracious, helpful and fun to chat with. Every member of the staff was kind and easy going. The food was excellent and the atmosphere was elegant yet modern. Looking forward to coming again! Melt in your mouth Short Ribs. A delicious meal! Loved the beet salad especially! I really love this place! Quiet but it was a rainy night. Food was excellent! Very nice server. booked the New Years Eve Dinner (I was also a guest at the hotel so seemed easy)..it's a nice room overall. The meal I had was just ok....seemed a bit understaffed when I was there (around 7) but the people on staff were very helpful so no complaints. I just found the menu boring and bland. $12 valet fee was half the price of my dinner. No street parking so you're stuck with very expensive valet. Will probably not return for that reason. Food was good; service was great. But parking just ridiculously expensive. farro, skirt steak, brussel sprouts, and more. Just wish they had a larger dessert menu. I ordered the scallop risotto. Scallops were delicious but the risotto was extremely salty. Absolutely delightful dining experience. Incredibly friendly and helpful staff (including the pianist). After dining, go up to the rooftop pool cabana lounge after dark where the vibe is soothing and romantic,,,, and the city views are amazing. Nice place and very good service. Good value money-quality of food. We sat out at the rooftop bar. The atmosphere was wonderful. It was a little misleading because after a certain hour they only have bar food and we were hoping for dinner. I had a steak quesadilla and my partner had a shrimp taco. The food was good and the service and view and magnificent outdoor vibe made up for our confusion. Food was average and service too long for such an early dinner!! Some of the food (appetizers) were good all around. The caprese salad was very ordinary. There is something all-over ordinary about the restaurant. And it is EXTREMELY overpriced! Could have gone to a much better restaurant for less. Came here for the Dine LA 2018.. Our meal was average at best which was really disappointing as the meal for two, including a couple of drinks, was over $200. We made reservations for Friday night expecting it to be busy but the dining room was empty which, in retrospect, makes perfect sense. There are much better options for this price point. Go somewhere else unless you have money to burn. I almost never review anything as less than 4 Stars, but this was pretty bad. We went at 8PM on a Friday and there was only one other table seated, and they had a different server than us. On top of that it took over 20 minutes for our server to bring our drinks, and during most of the time we waited he sat behind the bar and chatted up his friend. We ordered two simple entrees and it took almost an hour to get those. Also the menu is small and overpriced for the quality, in our opinion. I was very disappointed because I had been wanting to eat at this place forever, and it just didn’t live up to expectations. If you are in search of a comfortable East Coast oriented club style restaurant, Caulfield's fits the bill. 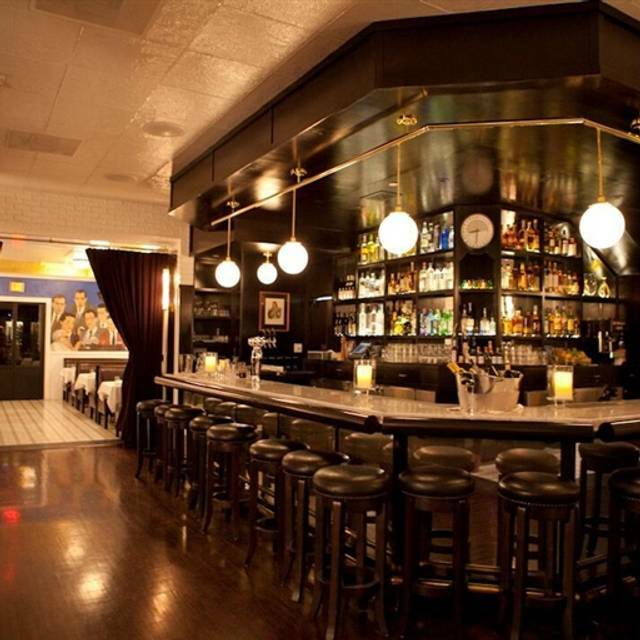 Nice diverse menu choices, great service, easy access within the heart of Beverly Hills. Feels like a club without the membership requirements or the initiation. Even as visitors from out of town, felt welcome. Very disappointing. Too bad bc it looks great and could be fun if anybody cared. We had a nice Birthday brunch here on a Saturday. We were surprised the place was completely empty until we realized afterwards that everyone was upstairs at the pool. Bottomless mimosas had the good OJ with pulp. Bloody Mary's were apparently strong tomato + horseradish flavored. Avocado toast was good and the huevos rancheros were fine. It was for my co-workers birthday. We called the order in ahead of time, and still didn’t get our food for 50 minutes. We already told them we had a strict hour lunch. The manager was very rude and keep giving us the side-eye with their waitress, until I approached her and explained to her why I wasn’t adding any tip or medical assistance for the servers. I will never go back to this place, u less my boss forces me to go. Aaron was our server and he was phenomenal. He made sure that we had time to make up or minds about what we want and still being engaged in our conversation. He gave great recommendations as well. Most importantly he was instrumental in making sure that the birthday being celebrated was a surprise and was very accommodating. He came off very genuine and that's rare. The booths were nice and the lighting was nice as well. The very tasty. We had the half chicken and risotto, both really hit the spot. This was a great first experience and I will definitely come back. Lovely atmosphere in tastefully decorated traditional restaurant setting. Comfortable location for lunch meeting or dinner with friends. Food has improved immensely. Best ahi tuna/avocado stack and jidori chicken. Usually, Caulfield's is much more quiet than it was this day. Good for them to be busy, but it was fairly loud, almost to be annoying. Kale salad with chicken was simple and very good, and all I had on this trip. But food is always reliable. Service is always very good as well. Very few diners and yet service was too slow—- forgot bread- didn’t refill water. Rarely checked on our table. Would hate Togo when it was packed! My dining experience at Caulfield’s today was one of the worst I’ve ever had. I’ve dined at their establishment many, many times for lunch, but today was the final straw. The soup of the day was salty, acidic, and there was a small plastic object in it. I promptly sent it back to the kitchen and was assured my main course would be out soon (they brought out of business partner’s main course when they brought out my soup). I sat for nearly twenty minutes before anyone approached me about my meal and it was another ten minutes before my main course landed on the table. The manager took the soup off the bill and only charged me for half of my main course, but the restaurant was nearly empty and there’s no excuse for poor, inattentive service when we were practically their only customers. This is the second bad dining experience I’ve had here and I will not be back. For the prices they charge and their prime location, it’s a shame more care isn’t given to their customers, their food, and their reputation. Came back the next day for Christmas dinner and to celebrate Carlo’s birthday with our kids! In LA visiting our Son for the holidays and popped into this gem for lunch . Found this amazing place on open table. After doing some last minute Christmas shopping at the Beverly center and not really knowing the city . We went on open table to find a place and found Claufields. What an amazing find it was! I had the kale chips and the grilled shrimp appetizer for lunch my husband had the grilled whole snapper what and amazing the lunch I think I hummed through my entire lunch it was great! The wait staff was awesome and the chef came out to great us, she is was so personable and just amazing! Such a tatted group. They made our introduction to Beverly Hills a bright one! We enjoyed it so much we had Chris dinner with them and celebrated my husbands birthday there the following day! Disappointing menu and very slow service. Salads were pathetically scarce, but hamburgers and frenchfries were well received. Ordered the Brussel Sprout appetizer without bacon; the first round came with bacon - returned for a bacon-free version; the replacement came after the entree; the remake was very tasty; the broccolini was not-hot; the salmon was medium-rare, but tasty; the sun-dried tomato "garnish" did not compliment the entree; the mashed sweet potatoes were perfect. The music was loud, but good. The service was attentive, sufficient and polite. I would go again, but would not order anything that required removal of any ingredients before service - not judging, just saying. Terribly inattentive service. Almost comically so. Very reliable in a relaxed environment, Caulfield's once again delivered. Finally had the avocado toast (it always looked good on past visits), and it was exceptional. Great tuna nicoise salad done with seared Ahi. Restaurant was very quiet, but service remained great. Wish they had a few more healthy options, especially among sandwiches.